Heads up, Leonard Ring, Bob Clifford and Phil Corboy, patriarchs of personal injury law: there's a new prince in town. Chicago attorney Kenneth B. Moll, 30, has compiled a roster of achievements in only 3½ years that many lawyers would consider sufficient for an entire career. He has won millions for his clients. His law firm has taken notice; last week it was renamed McDowell, Moll, Fitzgibbons and Drew. The coterie of lawyers involved in breast implant suits has granted him entry. And the headhunters are dialing his telephone number. Moll's current high profile in product liability litigation derives from the fact that he has garnered more than 50 breast implant suits. But unlike other attorneys whose eyes widened to the problem after Food and Drug Administration halted production of implants a few weeks ago, Moll has been handling the cases for the last two years. Calling himself "the valedictorian of the bottom two-thirds" of his IIT Chicago-Kent College of Law class, Moll has shown wisdom inside the courtroom. Initial success came during Moll's first year of practice when he won $4.5 million for the family of a boy who became ill after having a DPT, or Diphtheria Pertussis Tetanus, childhood vaccine- the nation's highest verdict involving DPT. Because of the boy's reaction to DPT, he was forced to live much of his life strapped in a buggy, wearing a helmet and sunglasses to control his seizures and wild behavior. Moll took the 4-year-old boy without the buggy, helmet or sunglasses, into the U.S. Claims Court, which heard the case. "I knew the special master had never seen a child with this [illness] before," Moll said. During Moll's opening statement, the boy ran up to the American flag in the courtroom, developed a seizure almost immediately, and ran wildly throughout the room. "I just wanted the special master [hearing officer] to see what this family lived with day and night," he said. Apparently the special master saw. After the verdict was announced, Moll was sought after for a TV appearance by "P.M. Magazine" and interviews for nearly 50 news articles for Moll. The publicity generated more than 40 new DPT cases and the nickname "Mr. Hollywood" by colleagues at his firm. But the development that proved most significant was a phone call from a Florida woman who had read about Moll's success with DPT cases: the woman said she had silicone-gel breast implants that she believed were making her ill.
She also said that she had been unable to find an attorney who would take her case. Moll told the woman he had never heard of breast implant cases before, he said. But he did not turn her away. Unlike when Moll was 17 and left home because he didn't want to listen to his father, a college professor "who liked to lecture," Moll now listened. And he learned quickly. Submerging himself in articles at the Health and Science library of the University of Illinois-Chicago the next day, he read in amazement about reported illness due to leaking breast implants. After Moll agreed to handle her case, the woman took her good news to the Command Trust Network, a 7,000-member national support group for women with breast implants. Now more than 50 implant cases fill up a good part of his office, and Moll is inundated with phone calls from women who want to sue and from other attorneys who want to file class action suits against implant manufacturers. Earlier this month Moll flew to Boca Raton, Fla., to meet with 40 other members of the Breast Implant Litigation Group, made up of attorneys whose spate of suits helped prompt the Federal Drug Administration to halt sales of the implants three weeks ago. Moll now spends every day and evening working on his own implant cases and is evaluating nearly 30 other potential claims, all with the help of only one temporary legal assistant. And he fields phone calls from headhunters who tell him he should be considering positions with compensation in the six-figure range that include a cut from his implant suits. But if Moll is outgrowing his five-member firm, he doesn't have time to realize it. In November, Moll had his first jury trial, where he represented the wife of a man killed in an auto accident. Jurors returned a $335,000 verdict, but it later was reduced by the judge pursuant to the state Dram Shop Act, which caps awards at $70,000. Moll, who tried the case by himself, wrote out every direct and cross-examination, each possible defense, and his responses to those defenses before the trial. "I didn't even know what to do for voir dire," Moll admitted. "So I memorized everything. I think I'll keep doing this for every trial." Allen J. McDowell, the firm's founder, said he is not surprised by Moll's success. "Moll will listen and others won't," he said. Moll has had the benefit of learning from mistakes and successes the firm had in dealing with nationwide DPT litigation, McDowell said. "The only thing he has told me to [do] is get more experience both in the court and out. But there's no question he'll get the experience," McDowell said. "Because we're a small firm, he's had the opportunity here he never would have gotten in a large firm. We wouldn't have given him the cases if we didn't think he could do it," according to McDowell. During his first year at the personal-injury firm, a "loser" case was passed down to Moll for evaluation. The client's son had been shot 13 times by a Chicago police officer who claimed self-defense. After reviewing the case, Moll told a partner at his firm that it should be tried. The partner said, "Here, you take it," with the clear implication that the effort would be futile, according to Moll, who ended up winning about $34,000 for the mother, and then convinced his partners to cut the woman's legal fees because she had a lot of bills to pay. Within a year, Moll agreed to represent two elderly women whose vision became worse after cataract surgery. A doctor who operates a chain of eye-care stores had given the women free exams before taking them and a bus load of other senior citizens for cataract surgery. With help from a handwriting expert who used an infrared light test, Moll discovered that two different ink pens had been used in compiling their medical records, suggesting that they had been tampered with and that the surgery was unnecessary. The cases were settled for about $150,000 each at the clients' request, though Moll said he wanted their cases to go to trial. 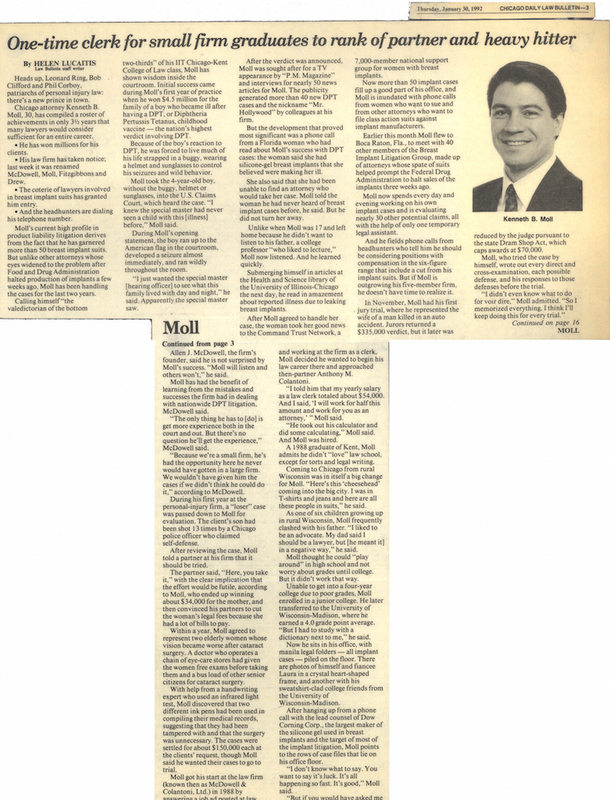 Moll got his start at the law firm (known then as McDowell & Colantoni, Ltd.) in 1988 by answering a job ad posted at law school for a temporary clerking position. While waiting for his bar results and working at the firm as a clerk, Moll decided he wanted to begin his law career there and approached then-partner Anthony M. Colantoni. "I told him that my yearly salary as a law clerk totaled about $54,000. And I said, 'I will work for half this amount and work for you as an attorney,'" Moll said. "He took out his calculator and did some calculating," Moll said. And Moll was hired. A 1988 graduate of Kent, Moll admits he didn't "love" law school, except for torts and legal writing. Coming to Chicago from rural Wisconsin was in itself a big change for Moll. "Here's this 'cheesehead' coming into the big city. I was in T-shirts and jeans and here are all these people in suits," he said. As one of six children growing up in rural Wisconsin, Moll frequently clashed with his father. "I liked to be an advocate. My dad said I should be a lawyer, but [he meant it] in a negative way," he said. Moll thought he could "play around" in high school and not worry about grades until college. But it didn't work that way. Unable to get into a four-year college due to poor grades, Moll enrolled in a junior college. He later transferred to the University of Wisconsin-Madison, where he earned a 4.0 grade point average. "But I had to study with a dictionary next to me," he said. Now he sits in his office, with manila legal folders - all implant cases - piled on the floor. There are photos of himself and his fiancee Laura in a crystal heart-shaped frame, and another with his sweatshirt-clad college friends from the University of Wisconsin-Madison. After hanging up from a phone call with the lead counsel of Dow Corning Corp., the largest maker of the silicone gel used in breast implants and the target of most of the implant litigation, Moll points to the rows of case files that lie on his office floor. "I don't know what to say. You want to say it's luck. It's all happening so fast. It's good," Moll said. "But if you would have asked me in law school whether I'd be doing all of this, I would have said 'no way.'"